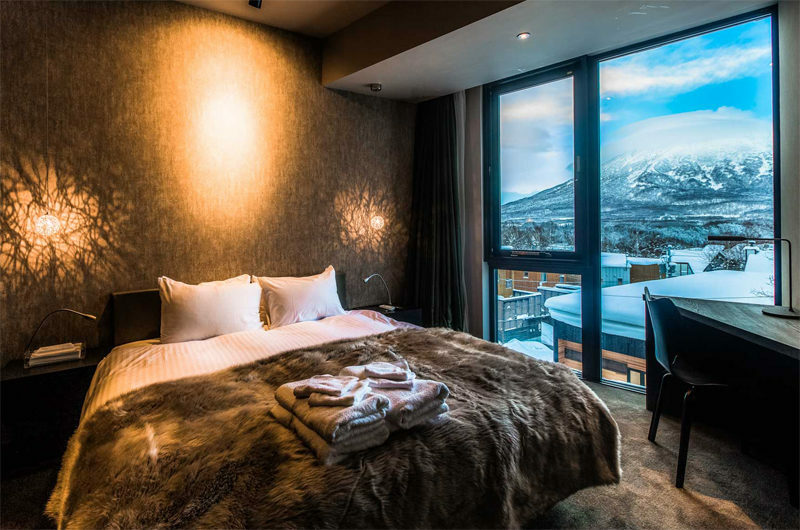 Haven Niseko is a spectacular four-storey boutique apartment building with one apartment on each floor. 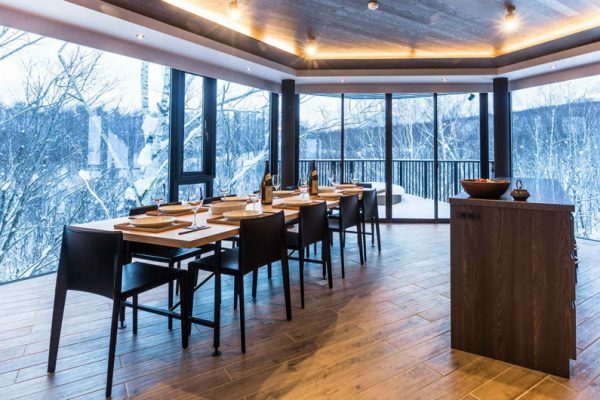 Located on a forested edge of Hirafu, you are able to soak in lovely views across the surrounding treescapes and of course, of the Niseko mountain peaks – the ski hill on one side and picturesque volcano Mt Yotei on the other. Haven’s apartments are cleverly designed to pack a lot of bedrooms into each apartment – more than most apartments in the village. 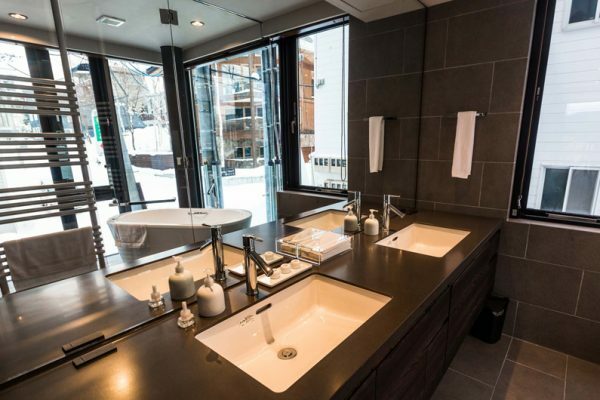 Interiors are suitably modern and stylish, in line with the latest in Japanese alpine trends, with luxurious bedrooms, en suites and bathrooms – master bedrooms have twin shower heads and deep Japanese-style “ofuro” bath tubs. 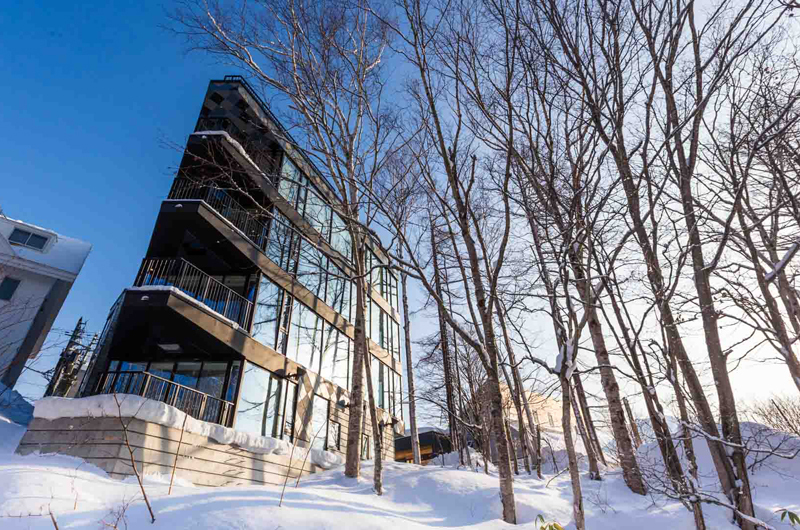 Lots of timber in the structure and furniture reflects the birch forest surrounds. 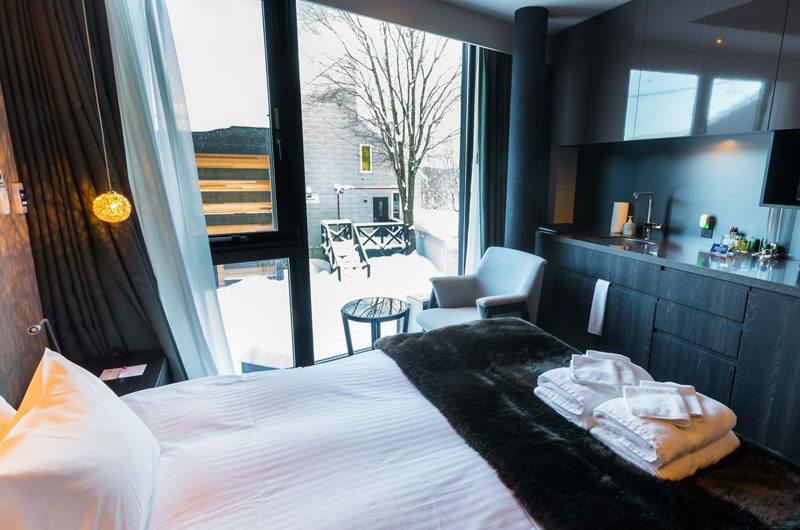 All rooms have wardrobes, many have desks and single lounge suites for reading or contemplating the views. All but the studios have gas fireplaces finishing off the ski chalet atmosphere. The top two apartments (301 and 501) each have a small cigar and wine room. 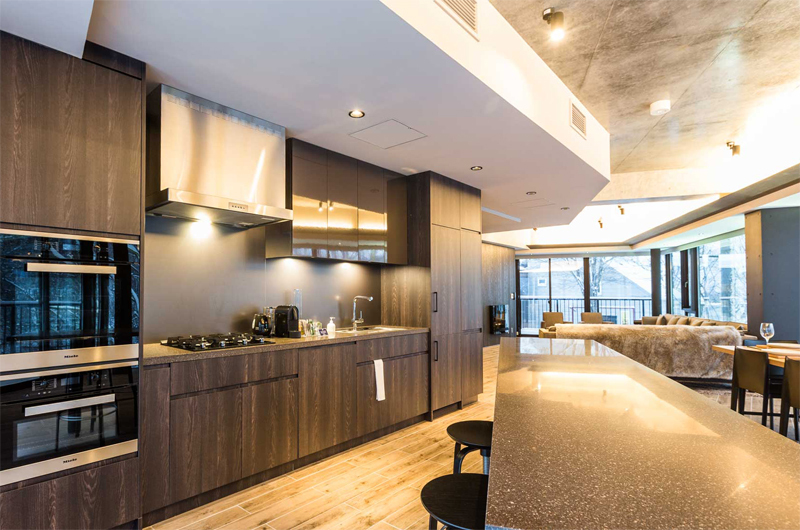 Apartments features galley-style kitchens with European appliances and private internal laundries with washers and dryers. 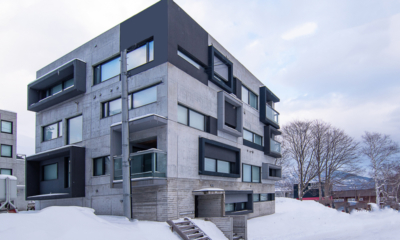 The ground floor features a ski entrance and private ski locker and drying room with boot warmer – you’ll love this before you step out into the snow. 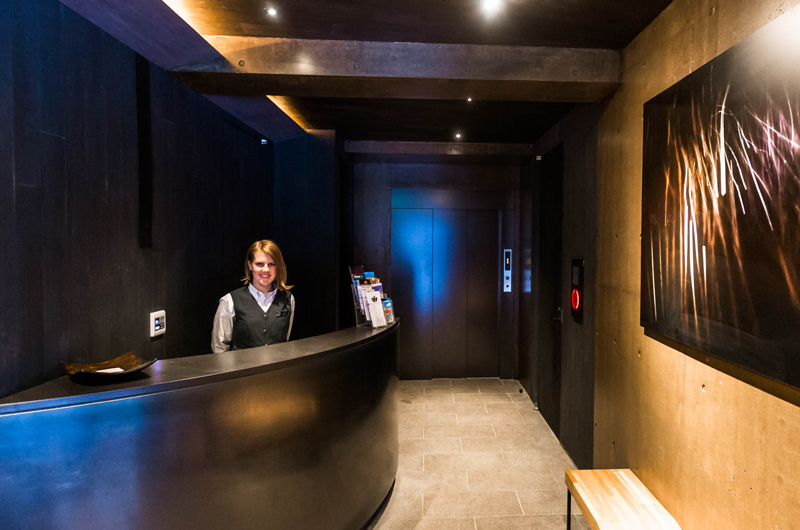 For convenience the building also has a staffed reception desk and concierge in the lobby. 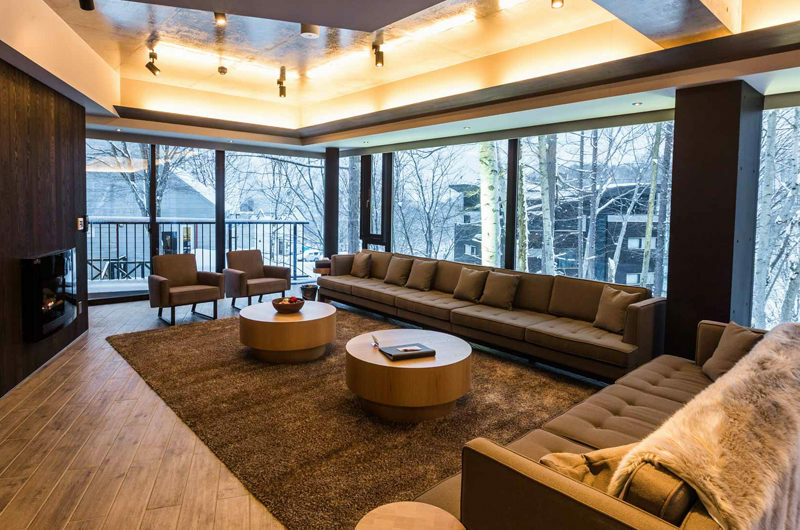 Each apartment features under-floor heating, which provides a comfortable and consistent temperature no matter the time of day or night. 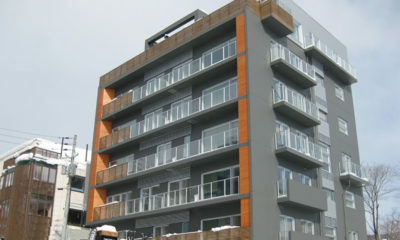 Opening off the living areas, apartments have cantilevered terrace balconies. * See apartment-specific additional features under each individual room listing below. * Studio rooms do not have Bathtub, Gas Fireplace, Dining Table, Breakfast Bar. 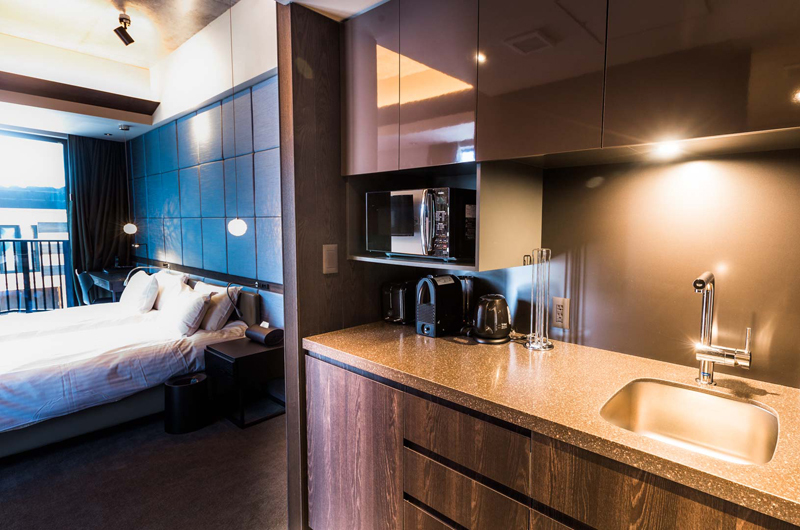 Studio Rooms feature kitchenettes with limited cooking facilities. 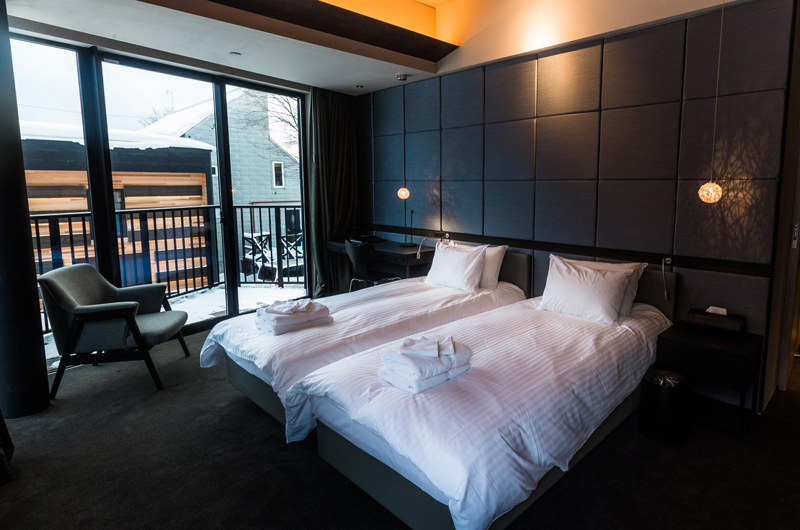 Two full-size bedrooms with en suite bathrooms, plus one smaller bunk bedroom (originally maid’s room). 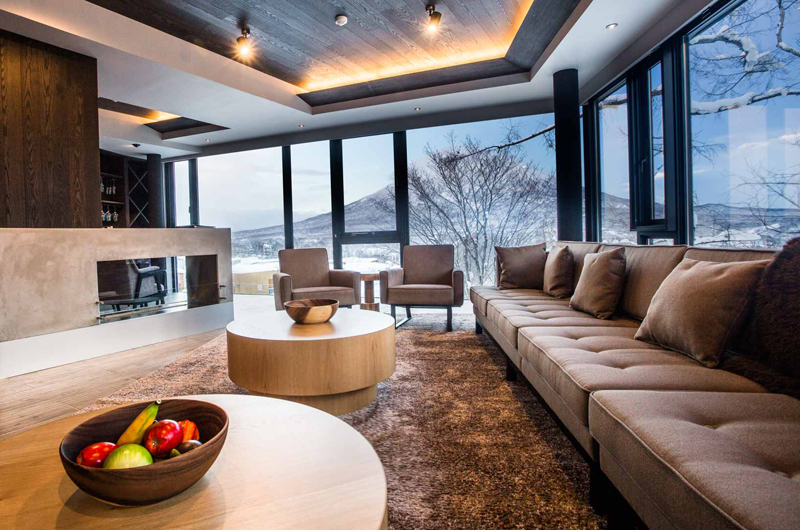 An expansive open plan living, dining and kitchen area with all the facilities you could need for an extended stay. Panorama floor to ceiling windows look out over three sides of the building to the forests, village and Mt Yotei. 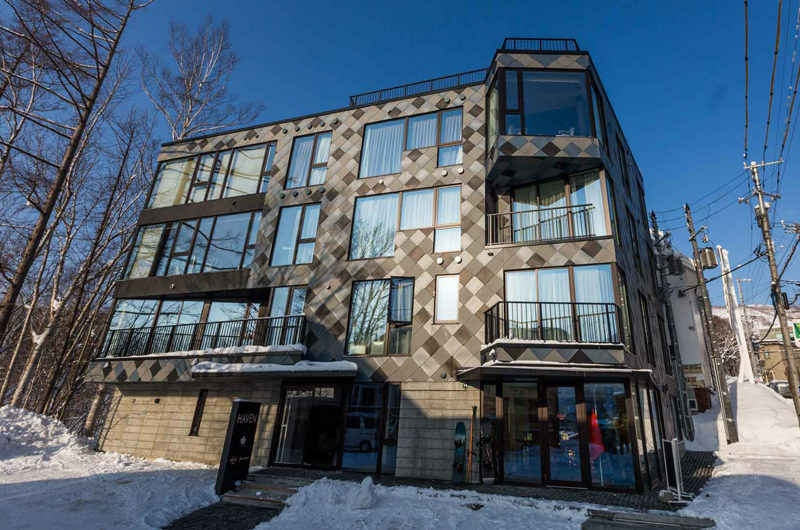 Connecting a 2-bedroom + bunkroom apartment with a neighbouring studio, this apartment features 3 expansive bedrooms with en suite toilets and showers, and 1 bunk room – perfect for the kids. Open plan full-feature kitchen, dining and living space with plenty of room for everyone. A feature gas fireplace and widescreen TV in the living space, floor-to-ceiling windows surround the common space with views out over Mt Yotei, the forests and village of Lower Hirafu. Separate key entry for one En Suite bedroom. 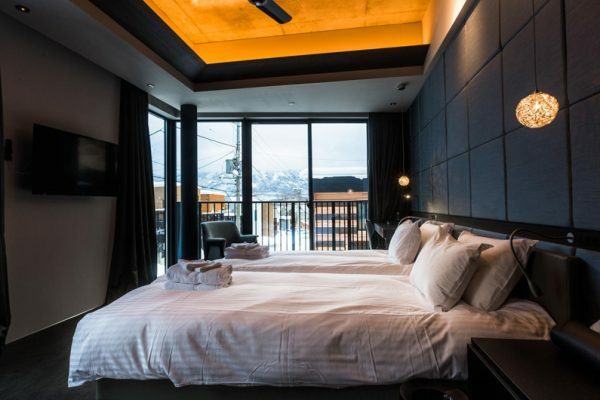 This apartment combines 2-bedroom + bunk room apartment with two separate studio apartments to create a 4-bedroom master suite that spans the entire floor. Expansive living, dining and kitchen facilities with feature panorama windows, combined with 4 expansive bedrooms with en suites and one bunk room for the kids, full laundry facilities and designer furniture and fixtures throughout – perfect! 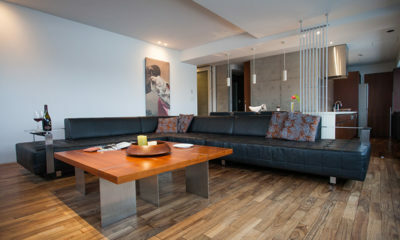 The studios connect to the main apartment internally, but also allow for extra key access from the elevator hall – maximum privacy in your big group. 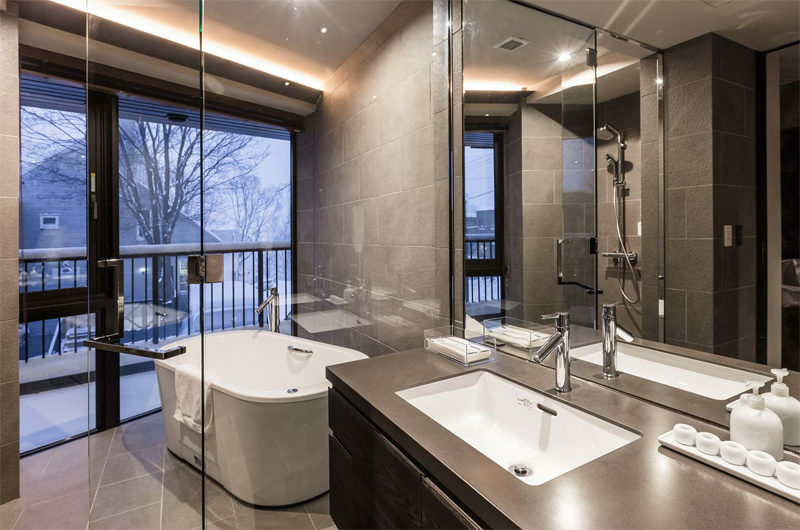 Features four expansive bedrooms with en suites, and one bunk room. 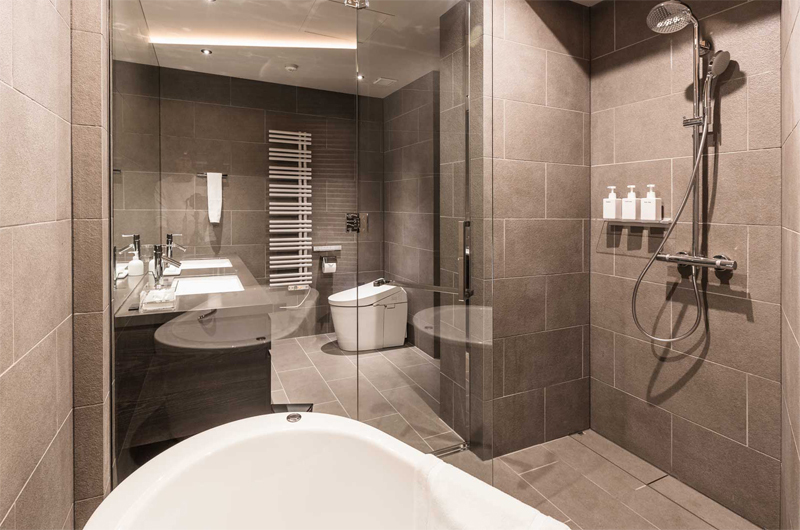 En suite bathrooms all feature toilet and shower, with the master bedroom boasting two showers and a feature bath. An additional common room ensures everyone has gorgeous rain showers any time of day! 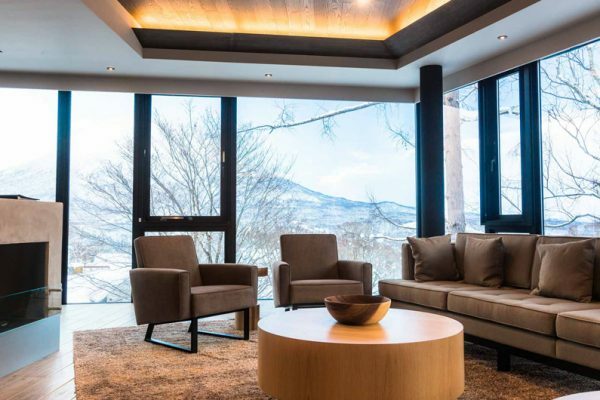 Expansive living, full feature kitchen, dining space for ten, living room overlooking gas fireplace, panorama windows throughout – add to this a special nook room behind the fireplace for late night drinks overlooking Mt Yotei. 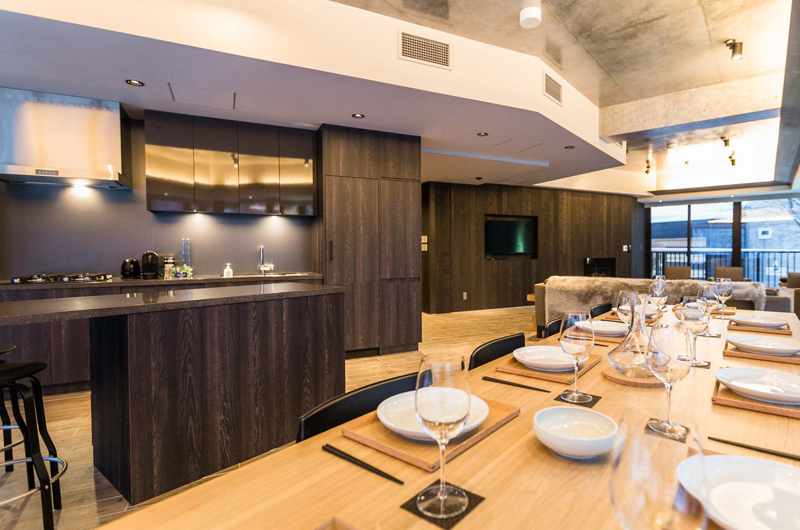 Management provides on-demand shuttle drivers around Hirafu village for penthouse guests, so everything in town is within easy reach. Have the whole top floor of Haven to yourself! 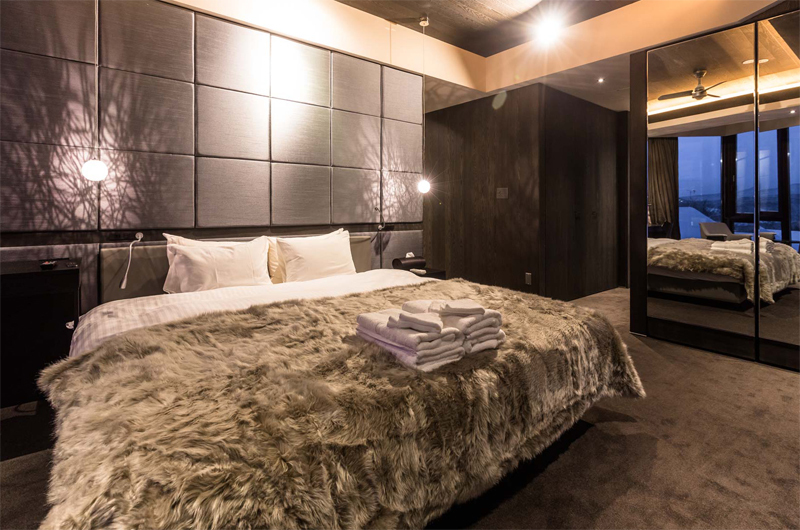 The penthouse features four expansive bedrooms with en suites, and one bunk room. 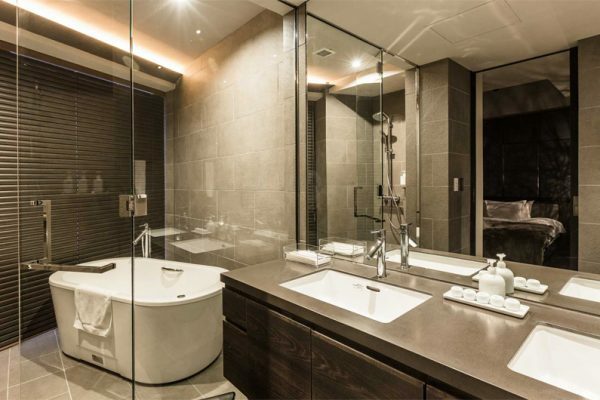 En suite bathrooms all feature toilet and shower, with the master bedroom boasting two showers and a feature bath. 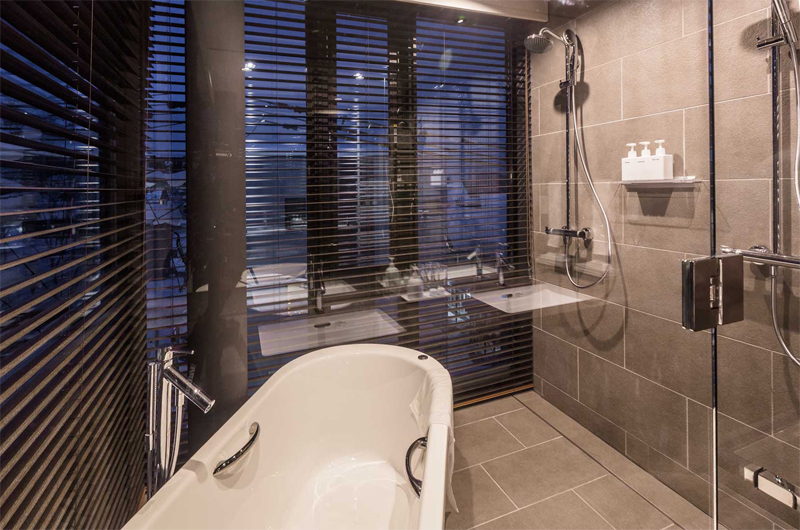 An additional common room ensures everyone has gorgeous rain showers any time of day! Expansive living, full feature kitchen (oven and dishwasher included), dining space for ten, living room overlooking gas fireplace, panorama windows throughout – add to this a special nook room behind the fireplace for late night drinks overlooking Mt Yotei. 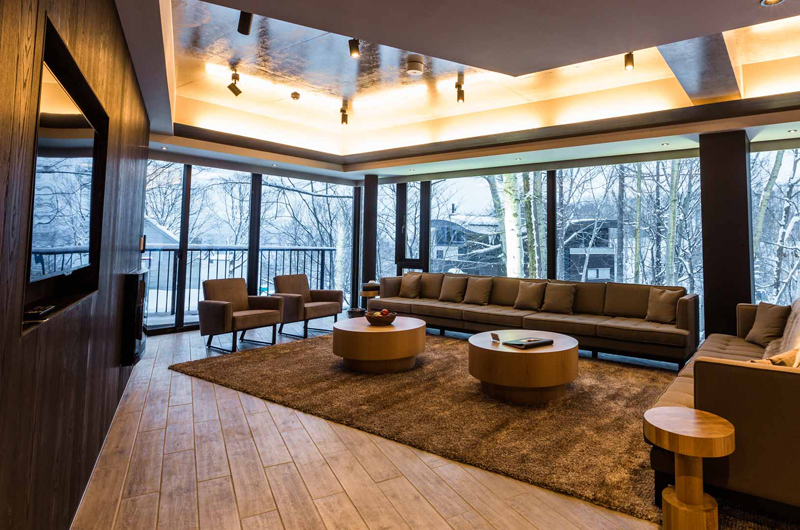 Management provides on-demand shuttle drivers around Hirafu village for penthouse guests, so everything in town is within easy reach. Haven Niseko is in a fairly unbeatable location – not only are you on the edge of the village overlooking a forest, with views of both the ski hill and Mt Yotei, it’s also an easy easy 10-minute walk or 2-minute shuttle to the lifts and the centre of the village, with plenty of restaurants and bars all around. 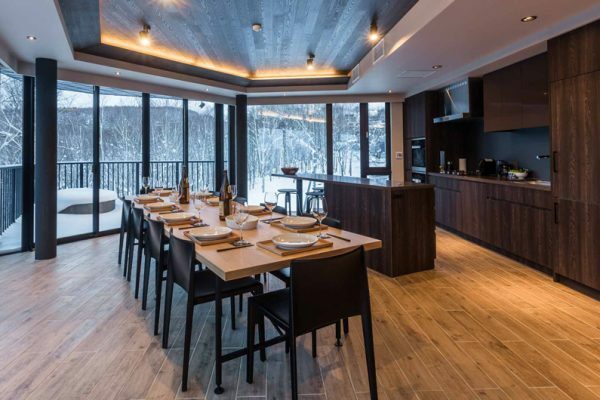 For your added convenience, Haven Niseko has its own Guest Shuttle to/from Hirafu chairlifts provided, and the free village shuttle stops just a few steps from the front door. It can whisk you to any lift, bar, restaurant or shop in the village until 8am-9pm. Booya! Just a stroll from the main intersection you are right amidst all the restaurants and bars you can dream of. Right in the vicinity are Gyu+ (fridge door bar), Moon Bar and Edge Bar, or the suave Hong Kong style club Powder Room. 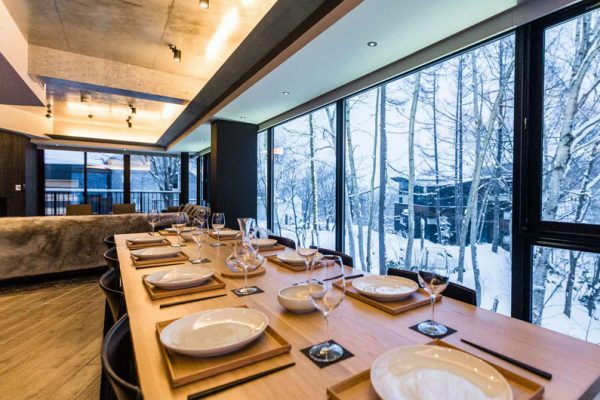 Or for some local Japanese flavour Ebisutei and Nagomi Izakaya restaurant/bars are also nearby. We stayed in penthouse 501 having the top floor all to ourselves early in March. It was almost perfect. The apartment is huge and offered plenty of room for all 10 of us. Loved the sweeping views, the location, the ammenities and cleanliness. 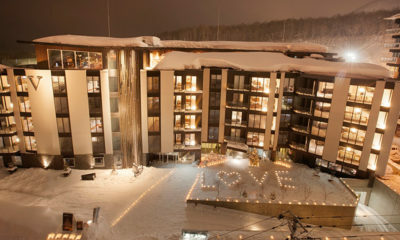 The staff on the concierge were lovely as were the drivers who collected us to drive us to and from the lifts each day. The only downside was that the 5th bedroom is a very tiny bunk room. While the beds were comfortable, there was no room in there for luggage, or anything other than two bodies really. 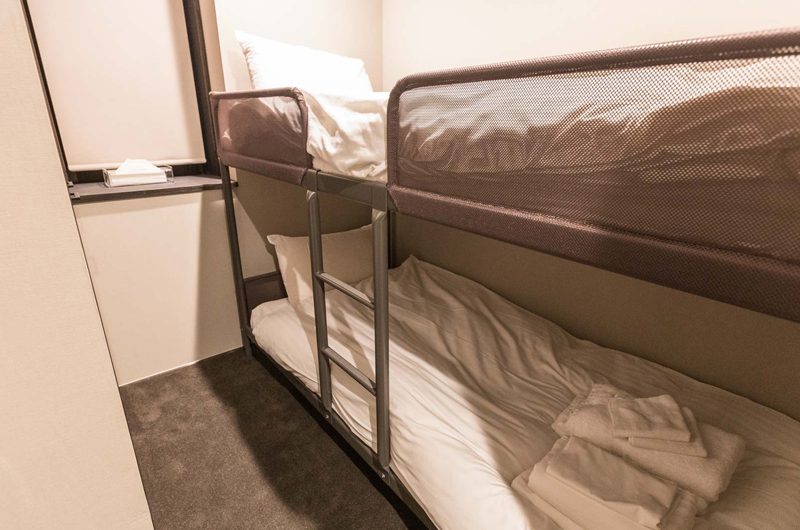 It is like a big store room off the laundry alcove with bunks squeezed in. I would say okay for kids but we had two women sharing the room and compared to the other lovely rooms, they really drew the short straw. 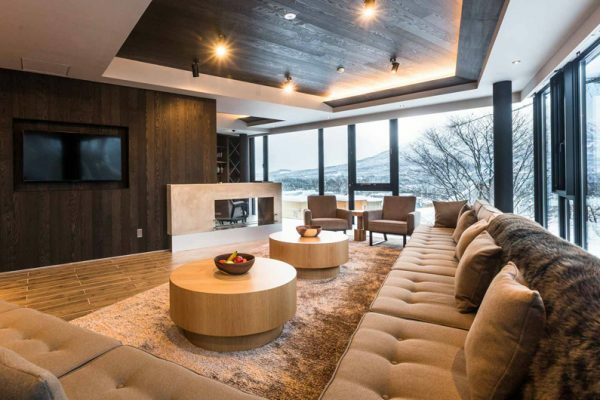 It is hard to find 5 bedroom apartments, and in every other way this one was fabulous. I would highly recommend it. Top quality in any of the equipment. View is nice during the day even better at night. All TV equipped with Apple TV. Ski room a bit small and not convenient as nothing to sit. New accommodation with top quality and services. Room was modern and clean as it’s newly opened in Jan 2017, located about 5 mins walk from Hirafu intersection where Seico mart ,ski buses stop and most restaurants are located. Location is good, a short 2 min walk up the road will bring you to Gyu+ bar. Was not noisy although it was located in front of another bar/restaurant. It’s possible to walk from welcome center(about 15mins?) although snow does make it difficult if you’re dragging suitcases. 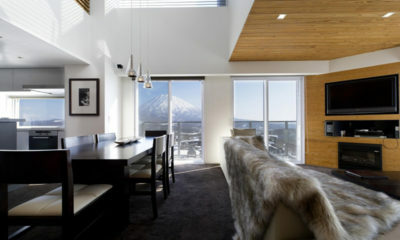 Accommodation itself is very clean, I was on the 2nd floor with a good view of Mt Yotei. Had a microwave oven, rice cooker, kettle in the room. 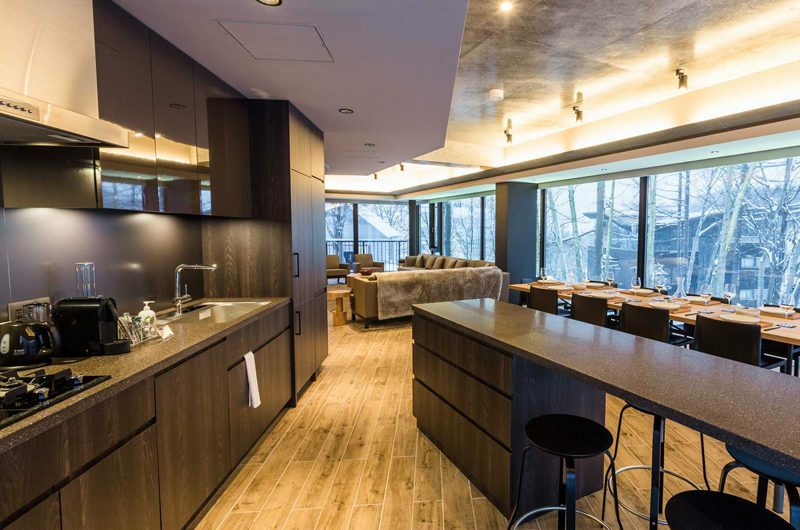 Ski Japan prepared some food items such as bread, fruits, ham, milk which I found really nice and handy. Non carpeted floor and the bathroom floor was heated which I found was another nice perk to staying here. 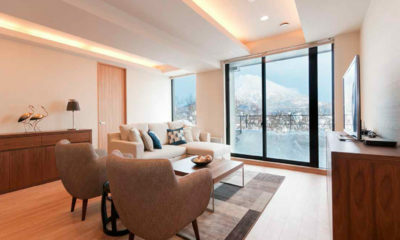 There are only individual 3 bedrooms on our whole floor which I belief could be converted to a single 3 bedroom apartment for one larger group because my room had 2 connecting doors. Reception is not 24/7 manned and it’s opening hours are something like 8am-10am and 4pm-6pm so please do let them know in advance when you check in. This was not a problem during stay as there was a landline in the room which allows for free local calls so you could call ski japan front desk to arrange for transfers, tours. They provide transfers to the ace family lifts and hirafu gondola. There is a locker on the ground level for ski and boards which I found too small to keep 2 boards. Ayumi at the front desk was really helpful to our needs and helped us quite a fair bit. 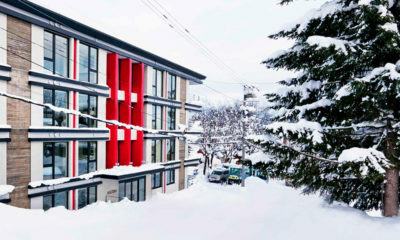 Niseko Spa and there was a physio located downstairs. Had a sports massage downstairs at the spa which I found to be very good although a little expensive(about 11,000yen if not wrong). 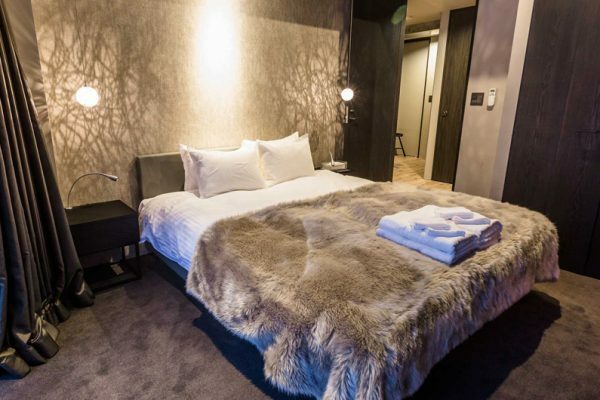 Few rooms in this small hotel but by goodness are they good. 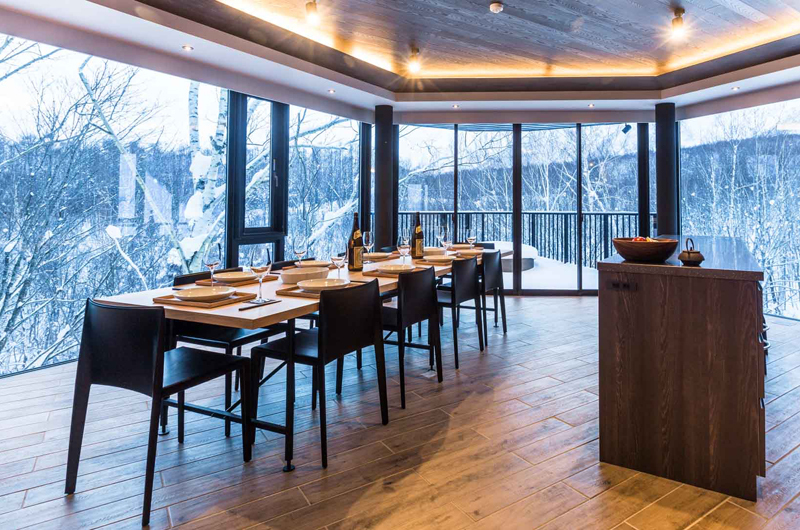 This was by far our favourite Japanese ski accommodation to date and it was a pleasure to come back to after a long day on the hill. The room was spacious, the bed was comfortable (at least a queen) and the bathroom facilities were superb. To top it off all of the staff we had contact with couldn’t do enough for us. Shout out to Tall/Kind Rob for the friendly greetings every morning you were on and your enthusiastic waving when you spotted us on the hill. Also Shortcut Megan for telling me about the shortcut that links the parallel streets, so handy if you’re dining half way down the hill! Hint: As your walking up the hill take the right hander just before you hit Bar Gyu+. You’ll have to climb a snow embankment but it was usually pretty trodden unless you’re up early after a big fall. Lastly to Ayumi for sorting us out for our day trip to Rusutsu, legend. The hotel had a day spa and a coffee shop on site which was handy. Private ski lockers were also provided but other than that it was the room and the staff. We didn’t see any other visitors although we had guests on our floor during our entire stay. The hotel was very new when we stayed and was still getting some of the heating connected. It was whisper quiet during all hours which was ideal and unlike other ski accommodation in Japan around this price we found there was quite a bit of storage room. There was an area where you’re to remove your shoes before entering the apartment and that was more than enough space for luggage. There was also a tiled hallway if you had long ski bags. Location-wise, you’re about 500m from the family pair. For us that was easily doable even though it’s up a hill. My partner did it in her ski boots every day no problems. Do I wish it was up near the main road? Yes. Is that a deal breaker? Absolutely not. This was a big step up quality-wise from our last stay and I think we both really enjoyed the extra luxury. 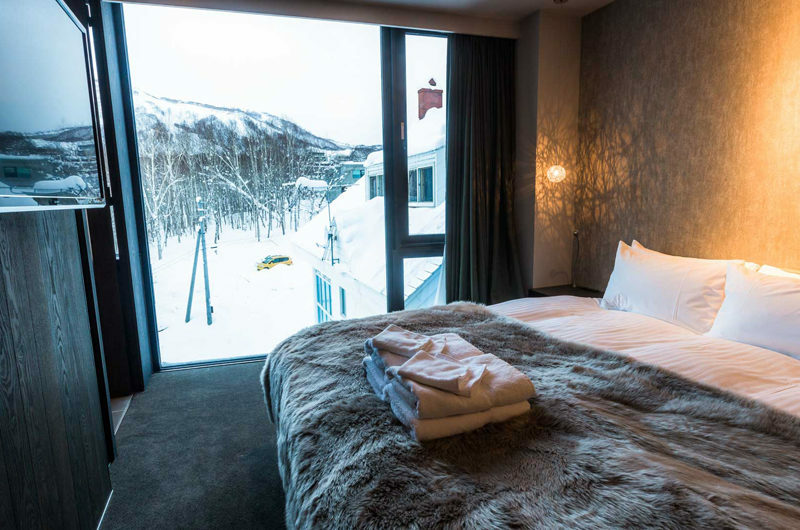 All in all a brilliant addition to the Niseko accommodation options and I can’t wait to get back there because this would definitely be on the radar again after such a positive experience.